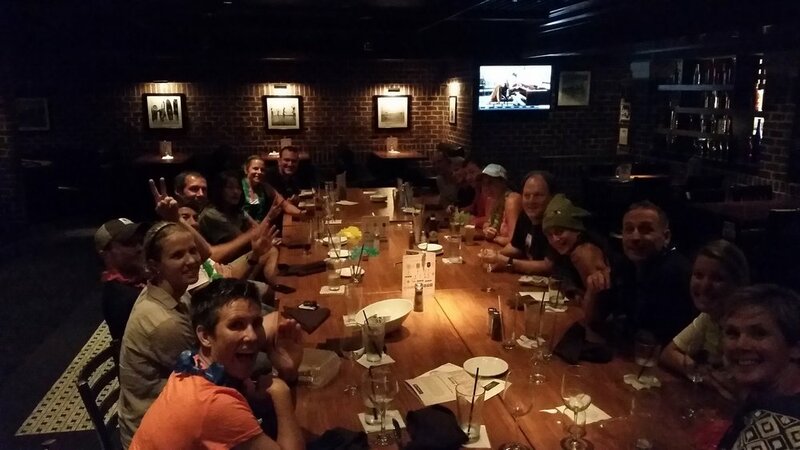 Local athletes doing the same race gather for a social a week or so before the big day. It’s a way to encourage first-timers, find out insider tips from athletes who’ve raced in the past and finalize where we’re staying, eating, training, etc. while we’re at the race venue. This year was a chilled out dinner at a local Thai spot with Holly, Michael and Susan who are also doing Chatty, plus: Erin, Jen, Sami, Charlie, Angela, Andre and James. It was just what we needed after a week dealing with the aftermath of the storm. It was just what I needed to get excited about racing - which has been lost in the surge of clean-up. Here’s our crazy crowd a few years ago celebrating Kona pre-race for Sami! For every IronDistance race, I pick a Pez to travel with me on the bike. The first year, it was a classic Wonder Woman. Last year in Santa Rosa, it was the new Wonder Woman. R2D2 was with me in Florida. I have a big collection and I’m always looking for new versions. For Chatty I chose……the Black Power Ranger. Quick-witted and clever, Zack relies on a combination of skill, strength, and agility to win his battles. The original Black Ranger is an energetic, charismatic, and fun-loving young man. He enjoys athletics (such as basketball, American football, and scuba diving), dancing (especially to a fresh beat bumping out of his friend's boombox)……… Zack is extremely confident and positive. You’ve heard of spirit animals? Well, Zack is my spirit ranger. He even matches my race kit and Lucinda. And I’ve already been seeing it everywhere. And, as everything, it has multiple meanings. It has been a reminder that IRONMAN is not black and white. It is not this or that. Nothing is set in stone. It is constantly changing and there are often many right answers - or no right answers! In a brand who’s motto is ANYTHING IS POSSIBLE, it’s also true that ANYTHING CAN HAPPEN. And already has! Have I mentioned that the swim was canceled before we even got here? So Zack is my spirit ranger. He will remind me to use my combo of strength, agility, confidence - and maybe a little dancing - to fight the battles of this race. Let’s see what we can do in the face of 142.6 miles. I can find motivation anywhere: from everyday training, a funny quote, chalk drawings, a Scripture verse or even a birthday card. At my first few pre-race socials, I received dozens of well-wishes - cards and photos and CD full of songs - and a giant box containing 140 index cards - reasons to tri (thanks, Sunshine). It is now stuffed with inspiration that I’ve collected throughout the years that make me feel strong and fast and “ironie”. If I’m driving to a race, I’ll take it with me. I usually take one book with me as inspiration. For this race, I’m taking Deena Kastor’s memoir LET YOUR MIND RUN for its little nuggets of wisdom from the Olympic marathoner. I read this book earlier this year and it really made a difference. Kastor used not just one, but a multitude of mental skills to improve her run and her life. She used her love of nature, the discipline of optimism and even visualization to garner more confidence, resilience and longevity.